Apologies for the break since our last post. The husband’s sister got married last weekend in London and we took a break in Madrid afterwards. The city is beautiful and energetic with an unbelievable food and drink scene. I have some extra padding around the waist to prove it! We are eating salads and meat-free meals for a week since we are starting to resemble a piece of jamon. We will spend time posting on Madrid after I finish the Christmas recipes, so stay tuned! Now, I know it’s been two weeks plus since Christmas, but I wanted to share our final two recipes with you. I know you all think I was slightly crazy to attempt all this food, and you are all right, I am! BUT, with that said, every single thing we made you can make too. 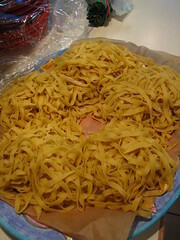 Although we made homemade pasta (thanks to our amazing Kitchen Aid pasta attachment! ), you can totally substitute dried and it will be equally delish. The secret is in the spicy sauce – we like it really spicy and extra garlic-y. You can adjust our recipe, but remember, it’s not fra’diavolo without the spice! I always use Lidia Bastianich’s recipe for pasta. It’s absolutely bang-on every time. Also, this recipe will work well with any type of seafood – calamari, scallops, shrimp-only, crab-only, lobster, clams or all of the above – use your imagination! Before you make the sauce, give your crabs some color if they have not been cooked yet by heating up your olive oil and adding the crabs for a few moments till they turn a bit red. This may be completely unnecessary, but I did it anyway. Remove the crabs and reserve on the side. Begin to make your tomato sauce. When you get to the third step of the recipe (at the same time you add your crushed tomatoes), add the wine as well as the crabs back to the pot. Allow this to simmer together for an hour. It will reduce a bit and the flavors will get much stronger. About 15 minutes before you are ready to serve, add the loose, fresh crabmeat to the sauce and stir. 5 minutes before you serve, add the shrimp to the sauce. Toss some of your sauce with your cooked pasta and plate adding some extra shrimp on top if necessary. Top with a half of crab, some parsley and a bit of extra virgin olive oil. Just wanted to let you know I made this last night with some calamari rings thrown in for good measure, and it’s incredible! 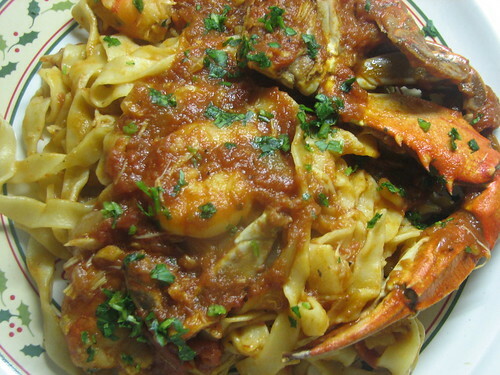 I never thought of adding other seafood to my fra diavolo, but now I don’t think I’ll make it any other way. Thanks again! that’s great! thanks for letting us know. this post was done so long ago… it’s great to see that it can inspire someone! so glad you enjoyed it! A outstanding Blog about how to cook FLEXTARIAN recipes. we’ve been called many things, Johnathon, but never Flextarian. Thanks for the props though. Incidentally, I had no idea that Buddhist vegetarians were forbidden from eating the “five pungents”. Far from being the soft pacifists of popular imagination, Buddhists must be some of the toughest people around. I could no more survive on the moon than without onions, garlic, leeks, shallots and chives!